Truckers claim small victory for Denham Amendment House vote as they continue their fight on to the Senate. 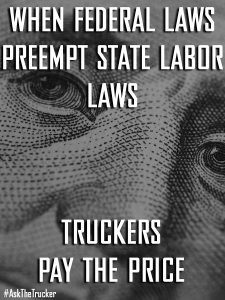 The fight continues towards one of the most heated debates in trucking, the addition of the anti-trucker wage amendment known as the Denham Amendment. ATA has lobbied hard supporting the Denham Amendment. Truckers and their supporters are against it. Later this year, the anti-trucker Denham amendment, if included into law, is to be voted on in the FAA Reauthorization bill . On April 26th it recently was passed in the House ( no surprise) but it first must go to the Senate for vote, and then on for the final vote. A Republican aide to the Senate Commerce, Science and Transportation Committee told CNN they are looking to have the legislation on the Senate floor in May or June and a long-term reauthorization in place by August. As truckers come off the heels of the ELD mandate and enforcement, drivers have been placed over the edge with the addition of the Denham Amendment in the FAA Reauthorization bill. It would be one more nail in the coffin against truck driver wages, and they know it. Truckers have had enough, and the outpouring of calls to their Congresspeople showed it this last week as the vote in the House to include the Denham Amendment approached. This is only one of many times since the first attempt November of 2015 in the Highway bill that the Denham Amendment has been able to make it through the House portion of a bill, however, Denham has failed to be included in the past when it met both houses of Congress and went for final vote. Driver outpouring has proven to prevail in the past, and we expect their fervor to be even greater this time. We already expected to lose in the House version of the FAA Reauthorization bill. What we are encouraged by is the fact that the vote is narrower than in the past when it was included in prior votes. Unfortunately the Denham Amendment is a partisan amendment, mostly Republicans are voting for it. The fact that more Republicans voted against Denahm this time, is a win for truckers as the bill moves to the Senate. As truckers continue to call their Senators, the momentum is on our side. Even with a last minute attempt by the ATA to discredit those fighting against Denham (namely us at AskTheTrucker), the enthusiasm by truckers to make the calls and send emails continued, and was overwhelming. Last night after the vote was announced, there was a lot of Confusion on FaceBook. Many had poured all there energy into fighting this bill, so when it made it in the House portion, many drivers thought it was now law. IT IS NOT LAW. Below is a post we made on Facebook to explain that although Denham was passed in the House, we had a small victory and can now focus our efforts to the Senate. Attention Drivers. 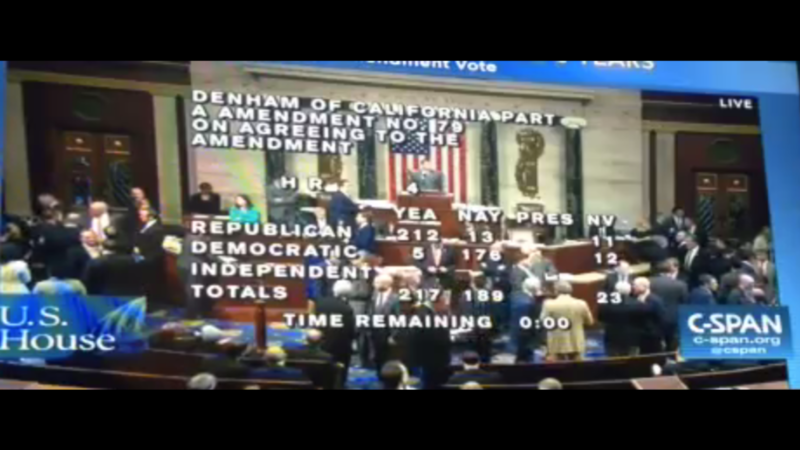 I want to thank everyone for all their support in fighting the Denham Amendment and calling in to your Reps.
1) Even though the Denham Amendment was included in the House portion of the FAA bill in Congress, it was passed with a MUCH narrower margin than the other 5 times it was passed. More R’s vote against passing it this time. Even though we hoped it wouldn’t pass, we should be proud at the Congressman we flipped. We will be making a PDF with the results so we know WHO voted for this amendment and who voted against it. Midterms are coming!!! 2) With this momentum,, we have a good shot at beating the #DenhamAMendment in the Senate bill. BUT ONLY if we keep calling out Senators. Drivers, we will not let the ATA slip this poison into law. Please pass this on. We don’t want drivers to think the Denham Amendment is law. It is Not. We still have the Senate and old Mo on our side. So continue on drivers, we can and will once again defeat the anti-trucker wage Denahm Amendment. We have been fighting since 2015, and with the added momentum now, the Denham Amendment in the FAA Reauthorziation bill can be defeated again. But only if we continue the fight. So on to the Senate and lets win there.